Quality and courtesy are inescapable in Stresa no matter where you stay. The majority of the accommodations presented here have views of the lake and represent all levels from comfortable one and two star hotels to luxurious resorts that hit the highest mark, fully equipped with spas and well-being centers. Discover the gift of hospitality that Stresa offers. Magnificent, magnetic and magical, they are recognized throughout the world for their beauty. They are Isola Bella, Isola Pescatori and Isola Madre, known together as Isole Borromee. 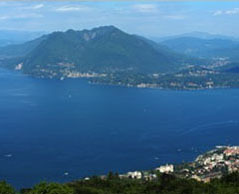 Mottarone Cableway provides a delightful 18 minute journey with spectacular views over the lake and the majestic Alps. In Stresa the freshest foods of the region are blended together creating cuisine to satisfy the greediest gourmets with dishes that respect both tradition and innovation. The desserts are enchanting, the gelateria are famous, and of course, there is nothing to compare with the choice of wines and beverages you will find here. Mountain biking puts nature right into your hands and right in front of your eyes. Exhilarating biking adventure awaits you here on the slopes of Mt. Mottarone. In all there are eight golf courses in a 30 km area around Lake Maggiore, one of the highest concentrations of golf courses anywhere in Italy.